Easily keep track of the time using the HTML5 analog clock. This innovative approach is a traditional way of tracking the time and is perfect for a mobile world, which is constantly on the go. 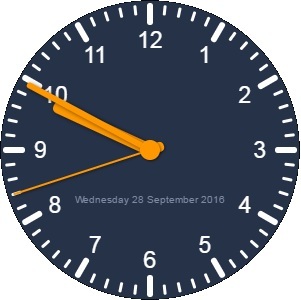 This widget offers several different eye-catching, visually stimulating options like changing colors for the date, hour, minute, second, and for the overall body of the analog clock. Additionally, the easy-to-use interface allows for you to create and change your updates instantly for all of your important events. This content app can be cropped to fit aspect ratio 16:9 or 4:3; this feed can be customized to fit any zone size except for the header and footer. Content is best shown in the side banner on a horizontal screen.